This month I got in touch with one of the biggest names in Scottish folk music, Dougie Maclean, OBE. 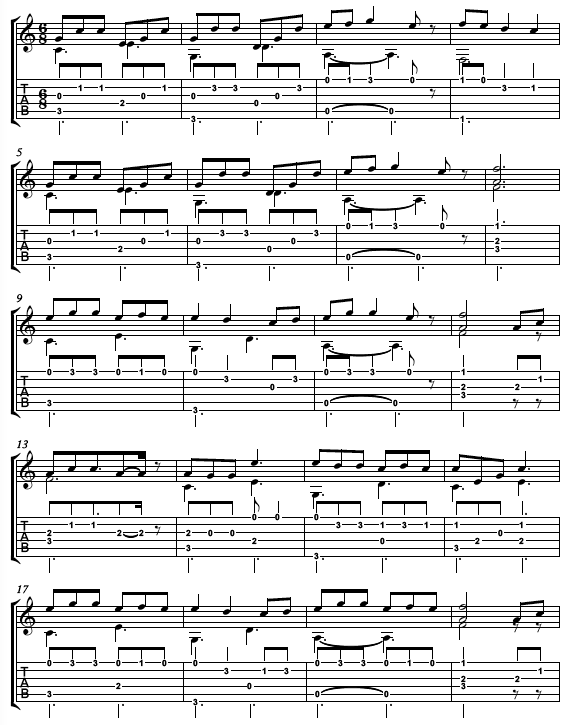 Below is my arrangement of one of Dougie’s best-known pieces, Caledonia. Many different artists have done their own take of Caledonia, but I urge anyone not familiar with Dougie, to check out the original. As well as being an accomplished songwriter and singer, Dougie himself is a wonderful guitar player in Celtic and folk styles. I have transcribed my arrangement in the key of C, though capoing at sixth fret is definitely worth a try once you’re comfortable with the piece. There is so much you can do with these Celtic tunes to put your own lilt on them. I tried to stay true to the original melody and took a “simple is beautiful” approach, to let the melody ring out clearly, as well as to make this arrangement attainable for players of all abilities. The other key thing to note is it’s in the key of C, using open chords we will all be familiar with. It’s easy to see how these solo arrangements are created using knowledge of the chords. Feel free for the more advanced among you to embellish this arrangement, as it’s easy to do and essential to developing your own playing. I found myself spending hours when arranging this, creating and building more advanced ideas and yet more hours stripping them back, to leave the arrangement you see here. With a traditional Celtic feel in six eight, ensure you let the melody notes ring into each other and let those bass notes sustain. I used the flesh of my thumb for more rounded bass notes and predominantly just the nails of my first two fingers on my right hand. While loosely talking about theory, a note on Rubato. Literally meaning “stolen time”. Expressive use of this technique can bring wonderful expression to a piece that’s unique to the player. In its simplest form, Rubato is the stretching of some bars or the slight shortening of others, in order to create dynamic, expressive passages. Experiment with this idea, though my arrangement is played straight in the video. Please note Rubato is a deliberate technique to add something to your playing and should sound deliberate. It’s not an excuse for being out of time. Start listening out for it in pieces by your favourite acoustic players. I used my Garrison G30 dreadnought for this piece with a Fishman Pro blend pickup but any acoustic guitar will serve. Finally, thank you so much to Dougie for agreeing to let me use this arrangement for the magazine and as ever I hope you all enjoy learning my arrangement.